Three years ago the Scottsburg Kiwanis Club conducted a pilot program recommended by Kiwanis International to do vision screening in Scottsburg High School. We learned that vision screening is mandated by the Indiana Department of Education for 1st, 3rd, 5th and 8th grade students. SCSD2 requested we do screening for the 10th graders to identify any vision issues since the last screening to provide the opportunity to correct so it would not hinder their studies through the remainder of high school. A committee was formed to plan and conduct these screenings. The pilot went off very well. All 10th graders at SHS were screened and ~10% were found to have some kind of vision issue. In partnership with Kiwanis International, the Scottsburg Lions Club and SCSD2, vouchers were obtained to assist kids get the needed lens and frames to correct their vision issues. After conducting the screening the second year, with similar results, the program was expanded to include the 10th graders at Austin High School. We learned Austin didn't have the new vision screening machines, but still used the eye charts. The Scottsburg Kiwanis Club in partnership with two of our corporate partners, Austin Tri Hawk and Scott Memorial Health, and a community partner, Kids First raised the $6,000 to purchase two new vision screening machines for SCSD1. This year vision screening was conducted at both AHS and SHS with similar results at both locations. Still about 10% of the students we screened were identified as to having some kind of vision issue. Kiwanis volunteers conduct the screening at both schools in the fall. Some of the students identified with vision issues have difficulty getting to an optometrist to get a prescription for lens and frames. The Scottsburg Kiwanis Club is working with local optometrists to arrange for follow ups with the 10% who need help. 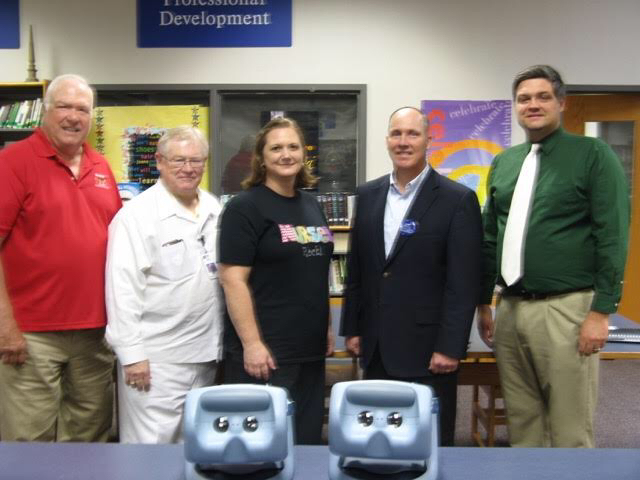 Pictured are Kiwanis President Al Riggle, Mike Murry from Corporate Member Austin Tri Hawk, Heather Crites, District Nurse for SCSD2, Mike Everett from Corporate Member Scott Memorial Hospital and Ryan Herald, Principal of Austin High School with the new vision screening machines purchased for SCSD1. Members of the planning committee include Heather Crites (SCSD2), Cindy Watts (SCSD1), Al Riggle (Kiwanis) and Steve Meyer (Scottsburg Lions Club). Some of the Kiwanis volunteers who have helped with the vision screening are Don & Millie Cooper, Jack McWhirter, Doris Marcum, Mike Everett, Darryl Smith, Terry Davis, Wes & Betty Clark, and Jaime Toppe.